" If I had one lasting impression from The Puck Hog, it was that I only wish it had been on the shelf of my local Brooklyn library when I was looking for a hockey book one winter's afternoon in 1939." Those powerful words come from none other than Stan Fischler, hockey's maven. I'm pretty sure Fischler has read every book on the subject of hockey. Oh yeah, and he's written a few dozen, too. So Fischler knows something about hockey books. Clearly Fischler has taken to Christie Casciano's series of books called The Puck Hog. Back in 2010 she released the original book in conjunction with the AHL's Syracuse Crunch. Well the whole gang is back in 2012 with The Puck Hog Volume 2: Haunted Hockey in Lake Placid . Sophie, Eddie and the whole team have graduated to Squirts level and are travelling to Lake Placid. The team is extra excited as several Canadian teams are making the trip south, and the gang is eager to show their stuff against the best. But as the team gets ready for the big showdown with the Canadians, mysteries arise and a totally different kind of Miracle On Ice is needed in Lake Placid this time around. Casciano has clearly found a great calling with the Puck Hog franchise. She has followed up the original with another winner, but this time really expands the boundaries of the children's themed hockey boo. This is great as it opens up endless possibilities. "On many of my school visits, children asked whether I was going to write a second book and there was a lot of encouragement to continue the adventures of The Puck Hog team. So I carefully listened to suggestions of school and hockey kids, collaborated with the husband, along with our two hockey players and decided to create the adventure in Lake Placid," Casciano says. "For the second book,. I wanted to challenge myself and take my writing outside of my own experiences. We blend hockey, history and mystery this time around! The first story centered around a selfish hockey player. This next one tackles the problem of the pushy parent. So hopefully kids will be sharing this one with their parents!" Great lessons to be learned all around from a great book. The title gets an obvious push in the Syracuse area and New York State, but you online book orderers should not discount this book when placing your Christmas orders. It isn't the most banner year for children's hockey books. But this one is an excellent choice for the young reader in your family. I'm a big fan of family-friendly activities. Books and hockey top my list. 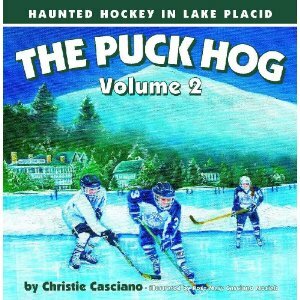 Christie Cansciano brings the best of both worlds in The Puck Hog Volume 2: Haunted Hockey in Lake Placid .